Boys Rule Boys Read! : Graphic Novels, Pirates, Princesses and GOOF OFF Day; AAArrrhhh!! Graphic Novels, Pirates, Princesses and GOOF OFF Day; AAArrrhhh!! Mrs. Yingling had this to say about our recent review of "Catching Fire" by Suzanne Collins (to see the review click Here): "It was with great reluctance that I turned over Catching Fire to one of my students before I read it. 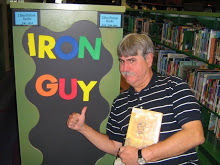 Maybe he'll turn it in late on Friday afternoon and I can take it home for the weekend..." Well, Mrs. Yingling, I hope you get hold of it soon because dare I say, I do, I do, it may be even better than the first book!!!!!!! 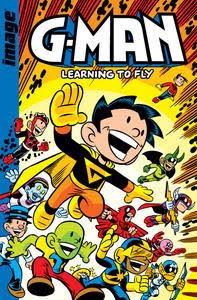 G-Man: Learning to Fly by Chris Giarruss - This is a great Graphic Novel featuring G-Man and his brother Great-Man and all their superhero buddies.They're superhero friends (all kids also) such as Billy Demon, Tan Man, Sparky among many others. Also in this Graphic Novel are special appearances by "The Mighty Skullboy Army," Santa Claus, a Psychotic Christmas Tree, "The Savage Dragon" and more. Enjoy such epic storylines as the Origin Stories of G-Man and Great Man and The Crisis of Multiple Dimensions. This is definitely one of the most fun Graphic Novels dealing with Superheroes I have read in a long time. The artwork is too cool and the stories are hilarious so you really need to check this book out (literally)!!!! As a side not I met Mr. Giarruss at Heroes Con this summer and he drew me this great picture of Spider-Boy (from Mini Marvels) who both fights crime and delivers papers and you would be surprised at the challenges posed by both occupations. Great stuff from a great guy!!!!!! Amulet (Book 2): The Stonekeeper's Curse by Kazu Kibuishi - This is the second book in the Amulet Graphic Novel Series (The first: Amulet: Book One, The Stonekeeper I reviewed on this blogs 3/27/2008 posting - Click Here to see that review. This Graphic Novel has brother and sister Navin and Emily continuing on their quest to save their sick mother. At the start of this book the elves are in hot pursuit of the new Stonekeeper (Emily), who must travel via walking house to the city of Kanalis (where people are cursed to slowly turn into animals but they do retain their intelligence and ability to speak). In this city they pickup an ally in the swashbuckling fox Leon Redbeard. When they find a doctor in the city, he tells them that the only way their poisoned mother can be saved is through the fruit of the Gadoba Tree which grows at the peak of Damon's Mountain. The only problem with this is that anyone who has taken this journey has never returned from it. Also Emily finds the Magical Stone that grants her magical abilities trying very hard to take control of her. Leon Redbeard offers to train her how to use the Magic Stone, but can she trust this mysterious mercenary? The artwork and story in this Graphic Novel are breathtaking. You really should tag along in this great quest full of action, strange machines, stranger creatures and all manner of good and evil characters. Highly Recommended!!!!!!! Artemis Fowl, The Graphic Novel: The Arctic Incident by Eoin Colfer, Andrew Donkin and Giovanni Rigano - In three simple words: Artemis Fowl Rules!!!!!!!!!! This is the second Graphic Novel adaption of the second book (duh....am I stating the obvious????) "The Arctic Incident." The highest praise I can give to this Graphic Novel is that it is just as good as the book (which is excellent)!!!! The story starts with Artemis discovering that his father who he thought was dead showing up alive, but there is one small catch. He is being held hostage by the Russian Mafia. While this is happening underground where the creatures of fairy live an uprising is taking place in the form of a goblin revolution. Through a misunderstanding Artemis (a teenage criminal genius) and his bodyguard Butler are arrested by Captain Holly Short (an elf) of the LEPrecon fairy police. After the misunderstanding is cleared up Commander Root (a cigar smoking, short tempered elf), head of the LEPrecon fairy police, and Holly agree to help Artemis and Butler rescue his father. Things quickly go from bad to worse for Artemis and company, as soon as the reach Russia, Commander Root is betrayed by a disgraced former associate and ally Cudgeon (an elf) and the brilliant, but not very stable scientist Opal Koboi (a Pixie). Let's just say things really just go to heck from there. This Graphic Novel is a great read so what are you waiting for???? Read it already!!!!!! Oh I just remembered that although I did not review it, I also read the first Artemis Fowl Graphic Novel that deals with his first encounter with the fairy folk that you should definitely cheek out also. Artemis Fowl Rules!!!!!! Well that's all for now yea scallywags!!!! Jana and Her Boys Tell Us More!